Sagging skin and excess fat on your arms only get worse with age. 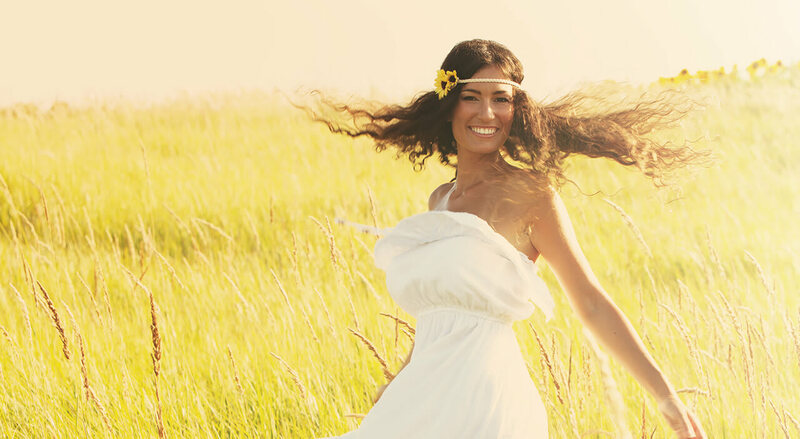 Dr. Kasrai can give you a leaner arm contour with a cosmetic surgical procedure designed to do just that. Like other women who have lost a dramatic amount of weight or are older, you may also be embarrassed about the shape of your upper arms. You may refuse to wear short sleeves and tank tops despite the hot weather. You'll even remain covered up at the beach — simply because you don't want anyone to see the loose, saggy skin on your arms. Aging and weight loss can both cause “batwings”. This is an unflattering term for saggy, wrinkled upper arms that are disproportionately wider in circumference than the rest of your arms. The arm lift (also known as brachioplasty) can remove excess skin and fat from under your upper arms. This gives them a slimmer, more toned appearance. The shape of your arms, from your wrists to your shoulders, will then be smoother. Gone will be the irregular bulges and sagginess that you have now. Incision placement is a primary concern for patients, as it determines how visible the resulting scar is. I always make sure to create the shortest possible incision in the least conspicuous place that allows for the most satisfying improvement. That means your scar won't be easily seen when you wear a tank top or bathing suit. It will only be visible if you lift up your arms. The arms have many nerves, glands and veins, and it is extremely important that they are not damaged during your arm lift. That's why I'm very careful when planning and performing brachioplasty. I take special care to avoid affecting any nerve, gland and vein. This ensures a faster recovery and reduced risk of complications. Your surgery is performed under general anesthesia on an outpatient basis. 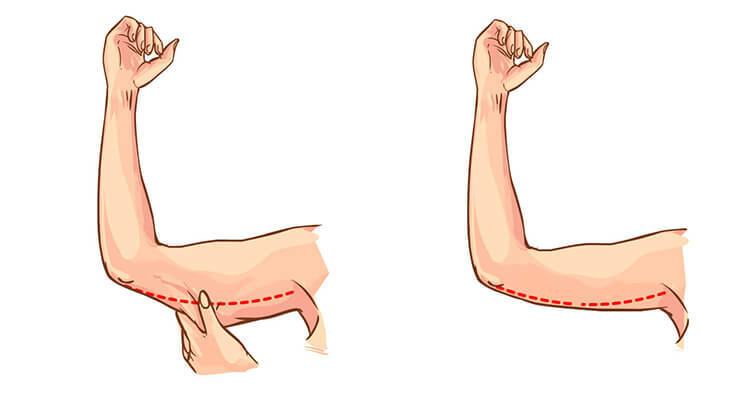 The left diagram shows the location of your incision during an arm lift, with the remaining scar shown on the right. An incision is made, usually from the armpit to the elbow on the inside of your arm. If there is excess fat, liposuction is used to sculpt your arm. Excess skin is removed then the remaining skin is redraped and the incision sutured. Finally, surgical dressing is wrapped around the arms, along with elastic bandages. You'll most likely feel a little sore after your surgery. I'll prescribe pain medication to ease your discomfort. Feel free to take this medication over the first few days after surgery to improve your comfort level. You'll have some swelling and bruising, the majority of which will subside over two weeks or so. You'll have to wear a special compression garment for a week to control this. You can return to work after a week. However, I recommend that you do not lift anything heavy or do any vigorous exercise until your incisions are fully healed. Before, you probably dreaded the hottest days of summer because you would still wear long sleeved shirts to hide your arms. Once you've recovered from your arm lift, that will no longer be the case. You'll love the heat because it means you'll get to show off your leaner, toned arms. An arm lift is also known as brachioplasty. It is designed to remove saggy skin and excess fat in the upper arm that droops down, creating a "batwing". Removing these tissues allows for a leaner contour that is more proportionate with the rest of the arm. It is commonly requested by men and women who have lost a great deal of weight, on their own or following bariatric surgery. You should be healthy and aware of the risks related to the surgery before you are considered a candidate. Brachioplasty can leave visible scarring along the inside of your upper arm. It is important that you're willing to accept this possible extent of scarring. I will discuss how long your scar may be before your surgery, so you have a better idea of what to expect. If you don't have a lot of loose skin, your scar will most likely be shorter and located primarily within the armpit. This is known as a limited scar and can achieve a high satisfaction rate, as detailed in Clinical Plastic Surgery. Liposuction removes excess fat, but it is unable to tighten up loose skin. Only excision, performed during an arm lift, can do that for you. However, liposuction is often performed at the same time as an arm lift. A 2015 study that appeared in Plastic Reconstructive Surgery proved that liposuction-assisted brachioplasty targeting the inner arms can provide satisfying results and an improvement in quality of life for patients who lost a lot of weight. How long do the scars take to heal? Scars generally take about two weeks to close, then a year or so to fully mature. During this time, it's important you follow the scar care instructions I'll give you to help them heal properly. Can I get an arm lift if I smoke? In surgeries that involve the removal of skin, it is extremely important that you avoid smoking for at least a month before surgery. However, this may be even longer depending on your condition. Smoking can significantly decrease your ability to heal and dramatically increase the rate of complications. That's why your surgery may even be rescheduled if you did not stop smoking for the required amount of time. You can probably get back to exercising two weeks after your surgery, however you should start off slowly and refrain from vigorous strength training. By a month or two, you should be able to fully return to your pre-surgery exercises. Can I get a breast lift or other procedure performed at the same time? Particularly for patients who've gone through massive weight loss, it is common to combine an arm lift with another body contouring procedure, like a tummy tuck or breast lift. I'll assess your health and expectations to determine if this is safe for you. All surgery carries some uncertainty and risk, but because of my experience, I've found that complications are very rare. Please note that scarring can be significant, however it will only be visible when you lift your arm.